After all, you probably already realize that Neosporin is an antibiotic that effectively speeds up the healing process when you do get a cut or scrape. In fact, some studies even suggest that it may cut down on some of the scarring that may occur after such situations. However, is this also true for dogs? Although most dogs have their fair share of mishaps, they do tend to lick them after they occur. This is because the enzymes in their saliva actually help aid in the healing process. Of course, this won’t always work though because there are some serious cuts or lacerations that a dog may occasionally have. When these occur, your instincts will kick in, and you’ll know that it’s time to get your dog to the vet so that he can get the help he needs. Simply put, no. You should not use Neosporin on your dog because more than likely, they’re going to end up ingesting it. Safe to use Neosporin for dogs? over the top of it, you’re still not going to be able to keep an eye on your dog at all times. When you least expect it, your dog will start picking at its bandage. This is something dogs are notorious for. Just pause and think about it for a minute. Why do you think that a vet or a surgeon will place a cone around your dog’s head after it has surgery? He doesn’t want your dog to be licking at the area. Without the cone around its head, your dog will more than likely lick and chew at anything that feels strange or any place that is seemingly vulnerable. So, if you are wondering Can you put Neosporin on your dog, you have your answer. There is a great alternative to using Neosporin called Ceragyn Wound and Skin Formula for Pets Although a lot of people haven’t heard of this before, you should know that it’s completely safe for your dog to lick and ingest. At the same time, it’s more effective than Neosporin when it comes to wound healing. Ceragyn Wound and Skin Formula for Pets has antibacterial, antiviral, antimicrobial and antifungal properties, which not only work for wounds but also are great for hot spots and fungal infections. You can use it for all other pets as well. Vetericyn is a wound and skin care product that is safe to use on all animals, including dogs. It’s non-toxic and doesn’t contain any steroids, antibiotics, alcohol or tea tree oil. For this reason, it’s safe to use around your dog’s eyes, ears, nose, and mouth when treating scratches, rashes, cuts, burns, sores, lacerations, and other types of wounds. Once applied, it will immediately get to work and won’t harm any of your dog’s healthy tissue. Although Vetericyn is admittedly a good product, PROTASIA-vs Skin and Wound Care claims to have more active ingredients. In the same way, that Vetericyn is a first aid product that will clean out your dog’s wounds, PROTASIA is almost the same thing except a few additional ingredients which enhance its efficiency. It is non-toxic, all-natural and can be used on lacerations, irritations, abrasions, cuts and other types of wounds. So, then, what’s the difference? 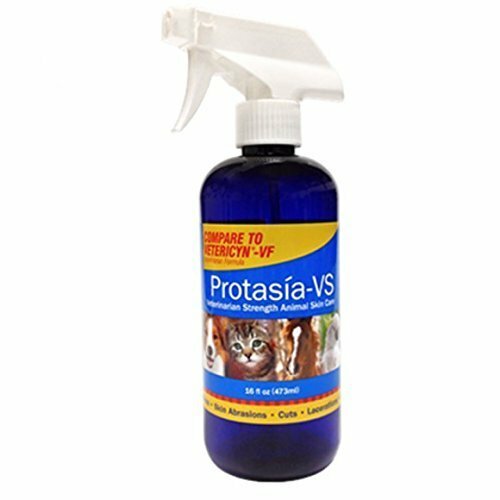 PROTASIA is almost a “clone” of Vetericyn except it has twice the amount of Free Active Chlorine (FCA)and a few additional ingredients that makes it a better option than Vetricyn. Veterinus Derma Gel has been very highly rated when it comes to infection control, as well as wound control and protection. Petzlife Wound Care is an all-natural pet skin care product that’s 100% safe to use on all animals, including dogs. Veterinarians recommend it for treating scratches, cuts, and other skin conditions, such as ringworm. Pet Silver Spray has silver in it, which is known to speed up healing in wound and burns care. It also has anti viral and anti-bacterial ingredients that is used for both internal and external treatment. Furthermore, it can also be used on flea, and insect bites. While a superficial cut or scrape will typically heal by itself, you still need to clean them in order to keep them from becoming infected. Otherwise, you should apply Vetericyn, not Neosporin, to the wound. Of course, you probably won’t even notice a small abrasion unless it’s bleeding or your dog is paying a lot of attention to an area, causing you to closely and carefully inspect it for yourself. Usually, you won’t need to put anything on it though. When your dog unfortunately has a serious wound, it’s important to take him to your vet so that he can be treated correctly. Your vet will figure out whether or not he needs stitches or just to have the properly dress it. He will also be able to tell you how to take proper care of it once you return home. Throughout this time, it’s important that you don’t panic. Instead, focus all of your attention to getting your dog to the vet. You can also place a tourniquet, or use compression, to keep your dog from losing too much blood. Of course, Neosporin isn’t going to do anything for your dog in this case. Dogs are fortunate in that they heal much faster than people do. They can usually overcome any superficial scrapes or cuts without any issue. It’s understandable that when you witness your dog get injured it’s difficult not to feel concern about their well-being. However, we do need to draw a fine line here so as not to over-treat them. Herein they really don’t need us to apply a lot of Neosporin to them. You now have an answer to your first question of, “Can I put neosporin on my dog?” It’s simply not a good idea to do unless you can guarantee that they won’t lick it at all. If it’s digested it could be toxic, which would then be counterproductive to what you’re trying to do in the first place. If the wound is in a location where the dog can’t lick, it, you can use Neosporin For eg: ear, top of the head. Furthermore, remember to be calm and take your pet to the vet if the wound is really serious. Most of the time, it’s best to allow nature to run its course.